Translation Tribulations: Want a revolution? 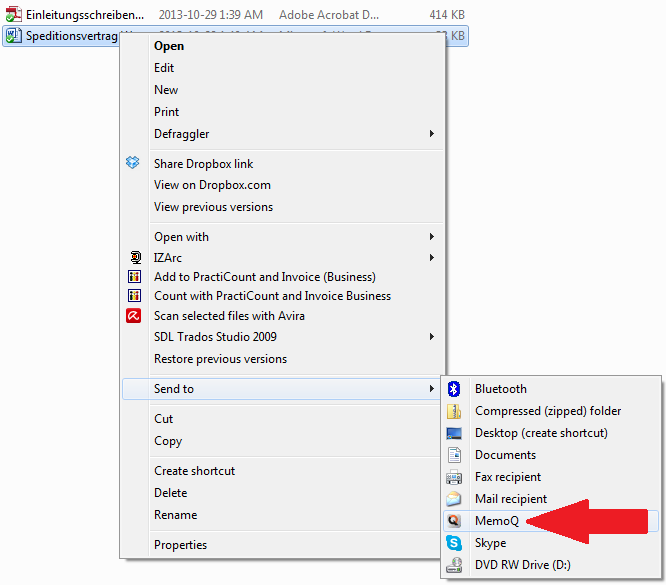 Try memoQ 2013 Release 2. OK, so I'm exaggerating a bit. And even though the new version of memoQ was officially released today by Kilgray, it really is still beta software. But damned good beta. I expect that there will be more of interest to individual translators added in this version of memoQ than in any other version I've seen up to now. Lots of T's to cross and i's to dot still, but there is great promise, and it's worth having a look now at the future of memoQ. I'm not talking about changes to the memoQ Server. There are lots of those in this version, and for a change many of them actually seem to be helpful to translators working on the server and less focused on slicing and stuffing linguistic sausage faster like many of the 6.x server features introduced. The rollout webinar with István Lengyel and Florian Sachse of Kilgray showed enough of why memoQ Server users should be pleased. But they could have filled the hour and three quarters with nothing but presentations of new or improved functions for the rest of us and still not run out of material. Since I still have a project to finish tonight, I'll just hit a few of the highlights that I'll probably return to later as the features stabilize and are truly ready for productive work. memoQ now intelligently recognizes the language(s) of the source text. This is a small convenience in setting up projects perhaps, but for those occasions when a source language has many passages in another language or more than one other language, these other language segments can be identified automatically, copied source to target and locked. I can think of more than a few patent dispute translations where this would have been helpful. A new feature under the Help menu gives a quick, friendly guided tour of important settings that are often overlooked that are hard to find for new users and many experienced ones. This is actually one of my favorite new features and possibly the best help I've seen yet for making a better start with the software. Custom dictionaries can now be imported from Microsoft Word with greater ease. Users can now also choose Microsoft Word for dynamic marking of possible spelling errors (unknown words). This is a good thing for those of us who hate Hunspell. Oh, and those pesky doubled words are caught now. an external application which runs in Microsoft Word and any other environment and allows you to look up text copied to the Clipboard in selected memoQ TMs. Too bad they didn't include termbases in this new feature. Yet. like direct import of InDesign files with a preview using the free online Language Terminal integration, Adobe InCopy and some file formats that must be pretty damned geeky because I've never heard of them. a plain text view which is about as exciting as lukewarm, unspiced pea soup. Well, because it's absence has been driving me nuts for years now. It's in this version. great things are happening with new import options that are still a wee bit buggy but will get very good very soon. Until now memoQ could only import terms as TMX and delimited text. New options include Excel (at last! ), MultiTerm XML and TBX. It was child's play for me to tweak a couple of TermStar MARTIF exports from STAR Transit to import those terms, because TBX is a dialect of MARTIF and STAR's MARTIF is very close to TBX. Extra effort? About 2 minutes of search and replace so I'm hoping Kilgray will go the extra five yards and touch this import option down. The addition of the MultiTerm XML import option means that memoQ users can now roundtrip data from memoQ to partners using SDL MultiTerm and back for termbase updates. Unfortunately at the moment, the only meta data transferred in the import is the definition field, but efforts are in progress to support at least the MultiTerm fields memoQ exports to XML with Kilgray's own definition. That was simply forgotten at specification time (oops). But still, this will be serious headache relief for those of us who work in teams with SDL Trados users and want to share terminology in the most effective ways. with edited files in any target format. It still has a lot of little quirks, especially with some formats, but here I expect a lot of improvements. I've made a little demonstration video and put it on YouTube; it shows the reimport of edited translations to update the translated file and the TM in memoQ, and it shows two different ways to look at tracked changes before revealing the dark secret of Row History Recovery which I think Kilgray didn't realize was possible. Well, damnit, they should have made it a feature with a button anyway. Thanks so much for this, Kevin - I missed the memoQ webinar live so it's great to find out about the new features. Your video on how to import a revised version of the target file is really useful. I've been trying it out now as I write, on a 28k book I translated. Unfortunately it hasn't worked - the two sides bear no resemblance to each other and the whole thing is full of pink cross-links. Perhaps the two-column table format in Word has confused it. Oh well, I'll just find a more straightforward text to try it out on! But in principle, a promising feature. I totally missed out on Florian's comment in the webinar that the alignment window will be upgraded at some point to mark differences, good to see that this is a priority. What I didn't show in the video is how one can also use the filter settings just to show the change-marked segments. That combined with switching on the tracked changes to compare with the last exported version can be rather helpful to get an overview in a big document. The preview (if available) will give you the context that is lost in the translation grid when the filter is applied. "Involve"? I meant "evolve" of course. Evil autocorrect elves strike again. Or Freud's Little Helpers. Kari, I just read your more detailed description of those files in the Yahoo list. OMG. Interesting scenario. I think I would precede it with a lock on the other language using the recognition feature, but this'll give me something strange to test on a smaller scale in any case. Not today, Greg, but soon probably. I have asked a few people to give me some small, non-proprietary samples with synonym structures and meta data that I can use for demo and testing; my clients would not thank me to show the process with the data I have at the moment. Basically I just looked at the differences between a TBX that worked and STAR's MARTIF structure. Two minutes of search & replace later the data imported just fine to memoQ. It was easy enough that it seems to me Kilgray could add TermStar-dialect MARTIF imports easily enough. But it probably won't happen soon if the people who can use it don't make that clear to Kilgray Support. There are a lot of priorities to juggle right now, and those who are silent about their real needs for real projects may have a long wait. The product planners are pleased to hear feedback; without it they really can't be expected to do much. So speak up, please!!! to "support@kilgray.com"
Wow! Thank you so much for your articles on 2013 R2, Kevin! I've been reading them in preparation for taking the leap from 6.0.59. It looks like I'll find lots of great new features. And thanks to your helpful comments and videos, I'll have a fighting chance of actually finding and using them! Thanks again! Thank you, Lisa. There have been many steady improvements since this post first went up, and I've discovering new gems all the time that Kilgray never got around to mentioning. And as of Build 53, it looks like most of the irritating issues have been resolved. More or less on the schedule I expected. Dear Kevin, thanks so much for your post. I am particularly interested in the language recognition feature. However, it looks like memoQ now doesn't support the scenario you've described, i.e. it cannot identify segments in a different language, copy them to target and lock them. Perhaps, I am missing something. As for the tracked changes, there are several ways to accomplish that without much ado in many cases. But until the full, original specification for the monolingual review feature is implemented, I really don't have the energy to discuss the details of dealing with the difficult editing examples.